This year my Christmas tree isn’t a natural cone-shaped heavenly scented Norway Spruce. You know the kind that makes your house smell like an enchanted forest and inspires you to belt out a rendition of Oh Christmas Tree every so often. It’s not even a cheap Douglas Fir. Not even. I would have been content to just fake it and assemble my artificial 9 foot made in Hong Kong green plastic tree knowing full well it meant spending spend the rest of the Christmas season spraying the house with the scent of pine-in-a-can. But even that option wasn’t available to me this year. For some reason unbeknownst to me, hubby decided he’d stack boxes of beer cans in my designated Christmas Tree space. You see, we own a convenience store and we live upstairs above the store. This is handy because we can just sprint down the stairs to work and we don’t have to spend a dime on transportation or gas. However, it is also a major pain in the neck for me because my living room gets turned into a storage room quite often throughout the year. I just wasn’t expecting it to happen at Christmas time. The minute I saw those red 12-pack beer can boxes being stacked neatly against the wall in my living room I knew they weren’t leaving there before the end of the year. In spite of hubby’s promises to remove them in time to set up the tree, I had the sinking feeling that they were there to stay. I pleaded, whined, threatened and reminded him that he has four storage rooms where he could have put the darned boxes. He promised he’d have them moved out of my living room and into one of the storage rooms just as soon as he cleared out some space for them. I realized that was a white lie when I saw more stock being unloaded from a truck downstairs right into the already full storage rooms. As Christmas drew nearer I resigned myself to the fact that those boxes weren’t going anywhere soon, so I figured I’d try to make a silk purse out of a sow’s ear. And spite hubby in the process. Ha! 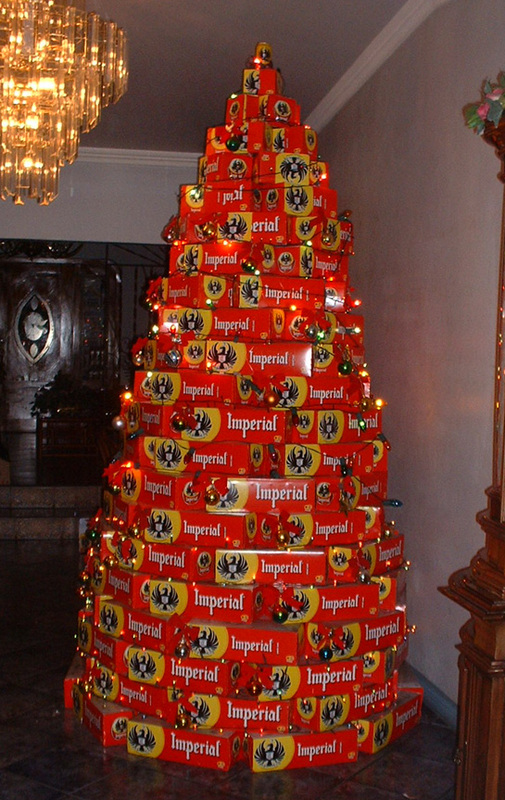 With the help of my two most trusted employees I began to stack the beer boxes in a Christmas tree shape. The very bottom layer is actually octagonal in shape. The next row on top of that one is slightly smaller. Then one on top of that is just a tad smaller as well…and so on. I ended up with a nice conifer shaped 12-pack beer can Christmas tree almost nine feet in height. It was a shame to let such a perfectly shaped tree go undecorated so I strung it with lights, hung a few red bows and shiny balls on it and placed a star at the very top. Well no, not really a star. It’s actually it’s a lone beer can. After I was done, I sprayed pine scent throughout the house and put on my favorite Christmas carol CD, then sat back with a cup of nog… feeling quite smug. I have informed hubby that he is not to touch those beer boxes til after Christmas. He was too shocked to argue. Ahh, the joys of the Holiday Season. I can have my tree and drink it too.